Did you hear?? It’s WASHI WEEK! What’s Washi Week you ask? 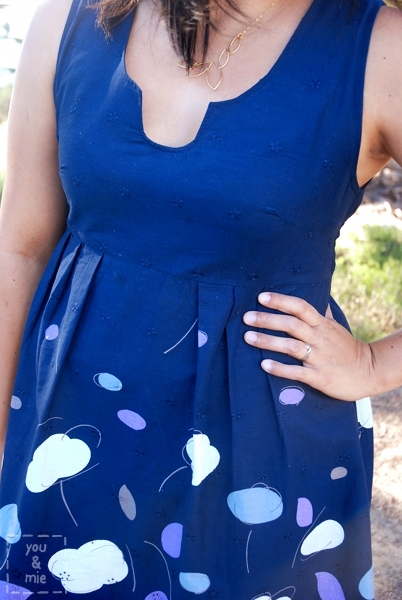 Well, the fabulous Rae, from Made by Rae, has an awesome new pattern coming out this week called the Washi Dress and she’s posting a bunch of different versions all week. 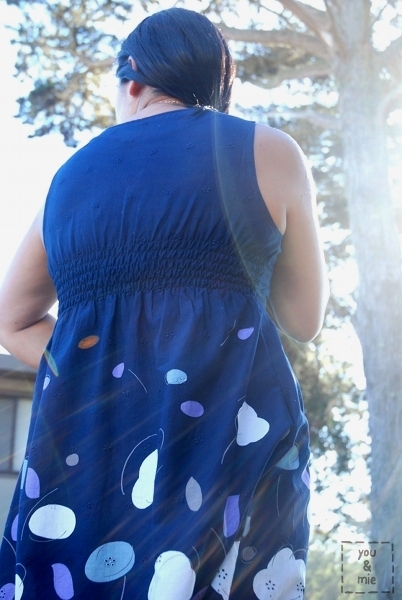 Ever since she posted photos of the original Washi dress, people have been going CRAZY asking for a pattern and waiting (not so patiently) for Rae to produce a pattern. Well, ladies and gents, it’s finally arriving and it is soooooooooo worth the wait. I was extremely lucky to be a part of Rae’s pattern testing group and I got to try out the original pattern. There have been many adjustments and improvements made since I tried the test pattern, but even in its draft form, the pattern was phenomenal. The dress is super cute, simple yet stylish, and very flattering. It has a fitted bodice with a pleated a-line skirt, pockets and a unique cut-out scoop neckline. Shirring in the back assures a perfect and comfortable fit and makes it so you do not need a zipper or button closure. Genius!!! When I saw how professional Rae’s versions looked and considering how intimidating sewing women’s clothing is to me, I thought this pattern would be complicated. But it was surprisingly very simple to sew up!! Rae has labeled this pattern for intermediate sewers, but I think ambitious beginners should certainly give this a try. The trickiest part for me was learning the shirring technique. The rest was a breeze! The pattern is extremely well written with clear instructions and awesome diagrams. Rae is extremely thorough in her explanations and really goes beyond regular directions to try and help with tips, suggestions and troubleshooting. There is a whole section in there about getting the best fit which I think will be very helpful for people who are new to sewing adult clothing (like me!). I would definitely suggest making a muslin (Rae talks about it in the directions). This is one of those steps that I always skip, because I don’t like wasting the time or fabric. But coming from someone who hates doing it, JUST DO IT!! This pattern is pretty darn amazing, but no pattern can fit every woman in all our different shapes and sizes. I used some fabric from an old sheet and made a muslin using the front bodice piece and the back piece cut just below the shirring lines. This way I could practice a few lines of shirring and make sure the bust darts and shoulders fit well. Rae offers suggestions for adjustments if you find it necessary. I would have been devastated if I finished the entire dress only to find out it didn’t fit. The one thing that I screwed up on my dress is the cut out at the neckline – it’s a bit puckered. I was rushing too much when I sewed it together (I’m sorry, I was really excited!) and couldn’t press out the wrinkles. Luckily, my fabric is dark and it’s not too noticeable. But I would recommend taking your time when you sew around the cut out, making sure your cut out is symmetrical and when you flip the facing in, that all your fabric lays nice and flat (this will probably all make a lot more sense when you are making your own). I don’t have any specifics about this fabric, except that I bought it on my recent trip to Japan at Tomato. It is a navy blue border fabric with eyelet at the bottom and embroidered flowers all over. The print is kind of a funky mix of whimsical shapes resembling clouds, petals and pebbles. It was kind of a random pick when I was shopping and I thought I might make myself a skirt or something. But right after I got back from Japan, the opportunity to test this pattern came up and I immediately thought this fabric would be perfect. And luckily I had JUST enough fabric to do it. It turned out to be a really practical choice for me – neutral and simple, with a little bit of fun. The Washi can be made as a dress or a tunic, and with cap sleeves or sleeveless. I’m already dreaming up different versions of Washis for me and ways to remix the pattern as well. I can assure you, there are more Washis in my future. Near future, I hope! Overall, I really can’t say enough good things about this pattern. As someone who does not normally sew for women or from patterns, this one really gave me the confidence to do both. Now I’m psyched to sew more for myself! It’s a very quick and simple sew with impressive results – I bet you’ll get so many compliments when people find out that you made the dress yourself! And it’s a really flattering style for pretty much every body type. I love how it skims right over my tummy and hips. Serious WIN. You can’t go wrong with Washi. It’s my new motto. Oh and to see more Washi inspiration, check out Kristin’s awesome Washi, Emmmy Lizzzy’s THREE Washis, and the official Washi Dress flickr pool. I’m telling you, that pool is about to blow up with fabulous Washis. 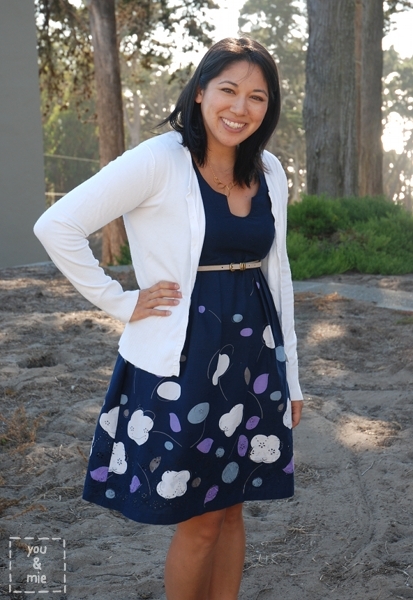 This entry was posted in pattern review and tagged dress, pattern testing, washi dress, women's clothing by Cherie. Bookmark the permalink. Love it!!! Great job…I am itching to get my hands on this!! You and the dress both look beautiful! I’ve been a silent follower of your blog for some time. Keep blogging, we appreciate you! Oh my goodness, LOVE it with the belt!! Such a sweet post, thank you so much for all the nice things you said here. You made my day girl! Of course, Rae! I wouldn’t say any of these things if I didn’t believe it! You rock and please keep up the amazing work! this dress looks great on you! I love the fabric, and the color is so flattering. Gorgeous Cherie, just gorgeous! Man I love that fabric, it looks so beautiful on you. Great work! WASHI WEEK!!! Holy Washi, yours is so gorgeous! And do are you! That fabric is seriously cool. I’m definitely getting peer pressured into making this dress. DO IT! DO IT! DO IT! C’mon, everyone is doing it!! so lovely! i just love that fabric. it looks absolutely GORGEOUS on you! what beautiful fabric, too. i can’t wait until i get my old body back and i can make one of these!! Oh please, you’re still smaller than me even with your cute baby bump. I bet this would work as a cute maternity dress if you lengthen it and use something with some stretch maybe?! Oh I love this! Yours turned out gorgeous – I need to get my hands on that pattern!! Beautiful!..you and the dress! 🙂 I really love the fabric you chose. What a gorgeous version of this dress. The colors suit you so well! That fabric is amazing and is so perfect for this dress. It looks like the fit is perfect on you too. So lovely. very nice job, cherie, beautiful fabric, work, and fit!!! !